Khandala – Lonavla are famous for monsoon treks, waterfalls and trips. We are familiar with Tiger Valley on the way to Bhushi dam. Mrugagad is situated in the Tiger Valley. The way to reach this fort is from Khopoli. 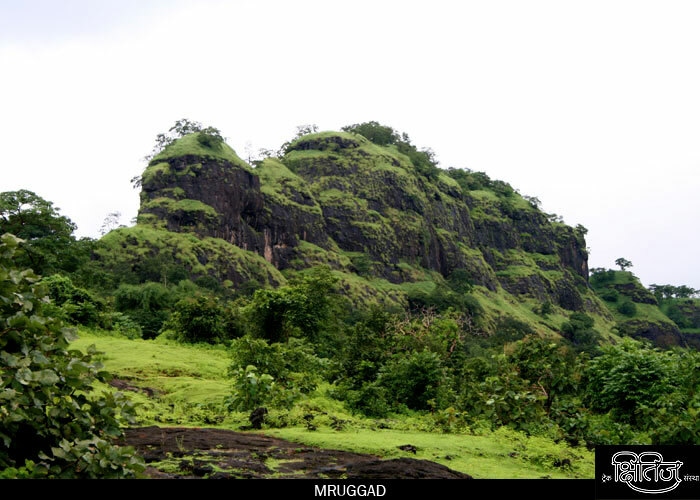 Mrugagad is a small fort, and it takes around one hour to see it. On the way to the top, there is a cave which is bit tough to ascend. There are some water tanks and a small pond on the fort. There are some water tanks on the summit. We can find some remnants of old houses. Since Umbarkhind and Waghdari can be seen from the top, it was used to keep a watch on these areas and the surrounding villages. We have to reach Khopoli station. From there, we can get share rickshaw for Lonavla Phata. From here, we have to take share six-seater to Parali village on Pali-Khopoli road. Six-seaters are available from Parali to Bheliv village, which is the base village. Amongst the three mountains near village, middle one is Mrugagad. It takes around 1 hour to reach to the top of the fort. The way is through dense trees, along the valley between the fort and Third Mountain and then over a rock patch to the top.